While you say the award happened because of all of us out here supporting it, I would add that your site won it because of the outstanding way that YOU continue to present your knowledge! I join in congratulating you on it all. Who knows where this recognition will lead in the future….. 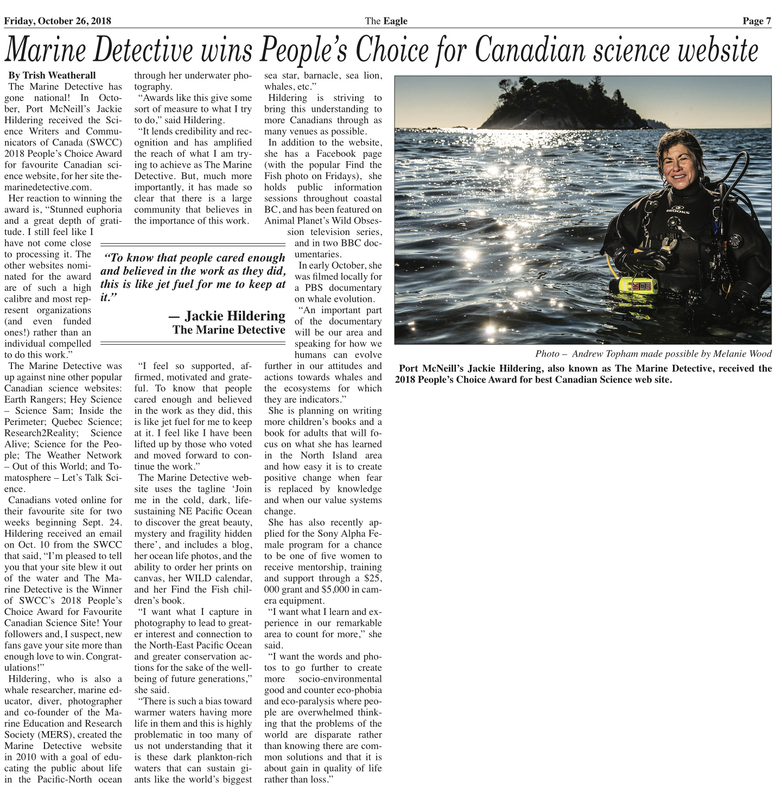 It is just wonderful – and well deserved, Marine Detective. Like others, I am excited and delighted that you have received the 2018 People’s Choice Award for Best Canadian Website. Well done, I am so glad for you and your website! So much gratitude to you Beth for the support and further motivation. Really value the feedback / encouragement Candace. Thank you so much. Well done and well deserved Jackie. Keep up the good work. Hello Jackie, a well deserved honour. There is no one who cares more about our Marine Mammals than Jackie Hildering!!! The best part of all this is you share your passion and knowledge with all of us. Going under the sea and recording what you see of this amazing environment and its inhabitants. Your photography is spectacular and the pictures speak for those who do not have a voice. Many thanks to you and enjoy your award you have earned it. Liz – thank you SO much. So motivating to get this feedback from you. They clearly know the level of impact your passion, wisdom and technical knowledge has on so many, particularly through the unique way that you share it. You’re inspiring the scientist in all of us – I know that my son (now 15) met you in Telegraph Cove with the Vancouver Aquarium folks when he was 5 and it was one of the highlights of his life so far (he remembers it vividly). I share your posts with him and I can see he’s inspired every single time (even to the point of recently expressing an interest in learning how to dive). All that to say, thank you for all that you do… it’s making a difference. So deeply appreciate this Victoria. It’s so powerful and motivating to me. Thank you so, so much. Thank you so much Marnie. You are so deserving. I have shared your Facebook and Web site with family and friends and we all think you are marvelous at what you do!! Means the world Shelly. Thank you so much for this kindness and motivation. Really, really appreciate the feedback Bob.